Upon watching The Hurt Locker, I realised that I had watched every movie nominated for Best Picture this year apart from the actual winner. So all this time I have kinda been fuming over the fact that my favourites Inglourious Basterds, District 9 and Up in the Air didn't even get a look in, but I had never actually seen the film that beat them. 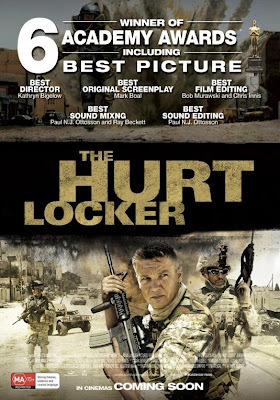 The Hurt Locker follows the story of an elite Army bomb squad who are centered in Iraq. Everything they do is done with extreme care as everything and everyone are potential threats and enemies. William James (Jeremy Renner) has seen a lot of bomb disposals in his time, and has found out that war and adrenaline are drugs to him. But while he is off at war, he has a family back home. Does he love war more than that? I can see why this movie won Best Picture. It is, for once, an interesting look at the war in Iraq. Because of it's tough topic, bomb disposal, it has a lot of adrenaline, which is helped by some fantastic direction from Kathryn Bigelow. She makes the film in a way that draws the viewer in to what's happening. Too often I found myself lost in it's world because of this. The performances are pitch perfect, especially from Jeremy Renner, who exudes greatness as the tough guy James. Anthony Mackie, also, delivers an underrated performance as Sanborn. Even Brian Geraghty is great, and I have already forgotten him in Open House. The cameos from Guy Pearce and Ralph Fiennes don't detract from the film as many other cameos do, and they just fit in so well. It's hard to picture this movie as a movie, because we have become so used to films so dumb and flat, whereas this acts like a real-life piece that could have been filmed as a documentary in Iraq. It sure is a great film with shattering direction from Kathryn Bigelow; her direction is enough to match twenty men, and I found it so hard to believe that a woman was directing this; however, I didn't enjoy it nearly as much as Inglourious Basterds, District 9 or Up in the Air. I do think it was better than Avatar, though. The film will probably go down in history as one of the best portrayals of war in Iraq. A masterful war film with some amazing direction from Kathryn Bigelow. A definite must-see.